March has been surprisingly productive considering the energy drain I’ve felt as I enter my third trimester with Baby #2. Since we’re prepping for E’s second birthday at the end of the month, I’ve unofficially designated the party as a target date to have a lot of my “Pre-baby House To Dos” in place since I know I’ll be well into my third trimester come spring. And let’s be honest, once the weather starts to get warmer, it will be all-garden, all the time. Refinishing the above buffet/sideboard from Brian’s paternal grandmother was a top priority since it’s always driven me insane to have so much wood on wood throughout our open downstairs living and dining rooms. It would be one thing if the pieces and flooring were similarly toned or if we had some decor and art layered in, but I’m still in a weird transitional place of not wanting to commit to window treatments and rugs and accessories until we figure out more of the “bones” — like function, layout, and “big pieces;” basically, the big ticket items that define spaces, like furniture and built ins. Just yesterday I was toying with the idea of moving the dining room table into the living room and transitioning the (unused) dining room into an office, since the dining room table serves as my work space most of the time. This would be a phase one example of what I was eventually envisioning as a built in dining area inspired by the picture above. 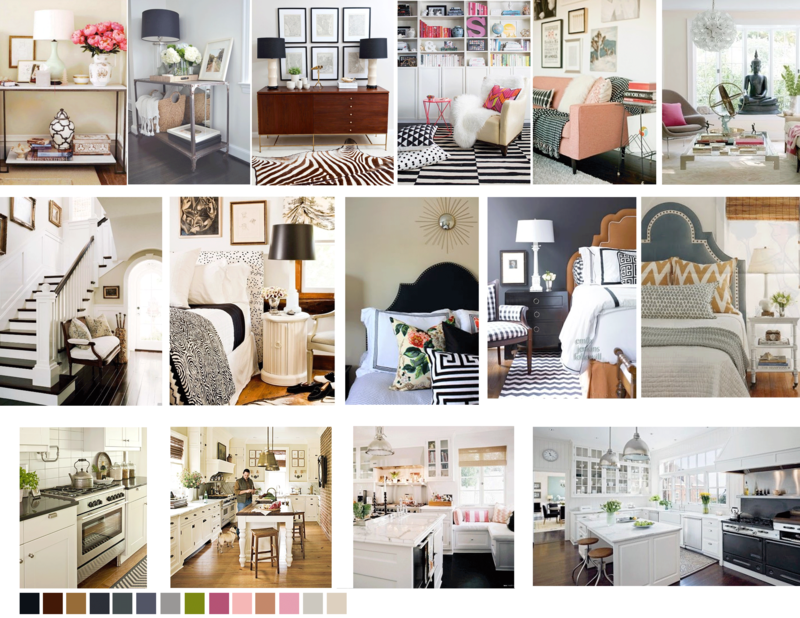 Drooling over everything, from the color scheme to the gold chairs to the window treatments to that lighting. Holy moly. Perfection! Anyways, I am really thrilled with how the buffet turned out and loved trying out a new technique for prepping it before refinishing (which I’ll detail in a future post). I still need to put a few coats of poly on it for protection and shine and choose hardware, but it’s not my priority right now. Refinishing it also gave me a nice kick in the pants to better organize what we store inside (now it holds my frequently used notebooks, office supplies and stationary) and how we use the limited space in our kitchen. I don’t know if you noticed it, but the white utility rack just beside the buffet is a new addition we used to have in our old apartment’s kitchen. It became such an issue to run up and down the basement stairs to get various appliances and pots that we decided to just store them there for now while we figure out what a phase 1 kitchen renovation will look like and what our needs really are. Hint: Phase one will likely involve tearing down the wall between the kitchen and dining room and adding seating to an attached island. Speaking of nesting, I finally got Emilia’s Rifle Paper Co., calendar prints up above her crib. The tape on the art prints needs to be patted down regularly and I dream of eventually having them all custom-framed in a metallic gold, but for now, I’ll take just having something huge crossed off my to do list. Her nursery finally feels like it’s more pulled together, but the issue of the wildcard rug we impulsively purchased and planned to just work with still sticks out sorely color-wise against all the other patterns and colors I think. It’s also definitely too small for the space but I keep holding out for the eventual transition of this space from nursery to share little girl’s room. Once we have Emilia’s “big girl bed” in here along with the crib, the size of the rug might work better, or I might just sell it on Craigslist and put that money towards a rug I really love. How about that gorgeous more appropriately-sized mirror we also hung over Emilia’s dresser and changing pad? Another fabulous HomeGoods find for just $35. The color is totally wrong for the room as it stands right now, but as I dream up the next phase of this room as a combined nursery/toddler’s bedroom, I think that color may eventually work so it stays for now, as tempted as I am to coat it with a metallic gold paint. Please ignore the hideously jumbled up curtain mess going on by her crib. I never properly finished backing the curtains with light blocking fabric so we have a very makeshift system still in place involving dressmakers pins and — cringe — masking tape to rig the windows to be totally blacked out for nap time. I should probably add finding a more permanent solution to that to our to do list, huh? In another example of fabulous makeshifting, I pinned the wild floral fabric we’d been using as a bathroom curtain (as I debated whether I liked it for a future Roman shade) to the actual shower curtain and am kind of loving it so there it has remained for almost two weeks now. I think the window needs a dark, woven grass or bamboo type blind and we’ll need to swap in a darker bath mat to make it all work. In the above photo, that’s actually a dark slate DKNY bath towels I bought after we moved in and I decided that dark gray/black/slate accents needed to happen in the bathroom to make all that pink and black tile look more chic. Working? Who knows. But the bathroom continues to be one of the most fun challenges for this quirky, 1950’s Cape Cod style home of ours. This wasn’t exactly a pressing “To Do,” but after enjoying our suite’s fireplace while we were in Maine and hearing chatters of this Danish concept of “hygge” all over social media lately, I was itching to recreate the cozy ambiance in our own home. We probably still need a good chimney cleaning, but our test run has persuaded me to move it to the top of our late summer “To Do” list so we can enjoy more cozy nights by the fire next fall and winter. And related — once the buffet was fixed up, I’d always planned to relocate the antique Federal mirror I’d had over the mantle and needed something else to fill the space. We tried a few mirrors we had laying around before I thought to try this print we purchased a few years ago at an exhibit at the Museum of Fine Arts in Boston. It’s Melon Boats by John Singer Sargent and this picture doesn’t do justice to the vibrancy of the pigments. When I viewed the oil painting at the MFA, I couldn’t tear myself away. It was like being on the ocean. I normally avoid purchasing prints in favor of supporting artists by purchasing original work but I couldn’t pass this up. Now all it needs is a frame. The front stairs are one of the biggest eye sores of our home and one of the things I most want to tackle this spring as part of a front yard makeover. Luckily, I have a few talented stone masons in the family so this should be a fairly easily project once I decide on the materials I want. Those terrible bushes flanking the door need to be ripped out ASAP too but they’ll remain until I decide what they’ll be replaced with, so stay tuned. The back stairs are equally hideous, but less pressing since the back patio overshadows it in hideousness. I also envision the patio extending well past where it currently ends, reaching closer to the back of the garage for really expansive entertaining space. Some built in seating, planters and a fire pit or pizza oven would be fabulous too, but I don’t know how deep I want to dive with a baby on the way in early summer. I think a simple phase I patio makeover is in order, but again, stay tuned. All in all, I’m really pleased with where things are headed and am excited to continue to layer in the more homey items as the weather gets warmer and the antique and thrift markets and fairs open up so I can really start to hunt for treasures to round out outfitting our first home.